Did you know that Make Room is an all-female team? So it’s only natural that we all look to other women in the industry for inspiration and motivation. In honour of International Women’s Day, we’ve shortlisted 8 seriously kickass women in creative industries around the globe, who also happen to have equally kickass homes. There is no shortage of instagram-worthy bathrooms, cosy nooks, and zen patio spaces when it comes to these women. We’ll be taking a leaf out of their page when it comes to designing our client’s newly renovated and styled homes! Beyond all the amazing art direction Bri does, she shares what feels like every part of her life on Instagram. She openly let’s her followers into her home, which she describes as her safe space. It’s refreshing to hear someone as influential as Bri talk so openly about her struggles and lessons when it comes to her own mental health. There’s no doubt that creating a beautiful, cosy, and vibrant home is a huge part in helping her feel happy and healthy. Her modern take on a bohemian style keeps us coming back for more! It seems there’s nothing this Bali-based babe can’t do! Along with her super successful lofts in Seminyak, Bali, Aylin also owns Straw the label, an independent boutique specialising in handmade leather handbags and accessories. Her two twin guesthouses sweetly named Happy Together have been recongnised by Airbnb as one of the best places to stay in Bali! Aylin was the brains behind the loft concept and the very insta-worthy design - I mean how could you go wrong with faded pink exteriors with lovely plants and handmade rattan accessories in every nook?! Charlie is Singapore-based like us! So we’re always looking to her for her styling ideas and shopping tips because there’s no denying it; Singapore is small and it’s easy to feel like you’ve been there done that. Charlie is a stylist, photographer, blogger, mom, co-founder of The Assembly Hall, and still manages to find time to run Lottie is Loving and create stunning images of her colonial home! She’s a pro when it comes to taking stunning, bright images of her light-filled home. Her minimal design style makes us feel like her home is a peaceful haven away from the bustling city. Sometimes all we want is to be Scandinavian… is that too much to ask?! You might know Stephanie better as hey.mia, an interior design blogger who uses her own home as her canvas. We would too if we lived in a space like that! 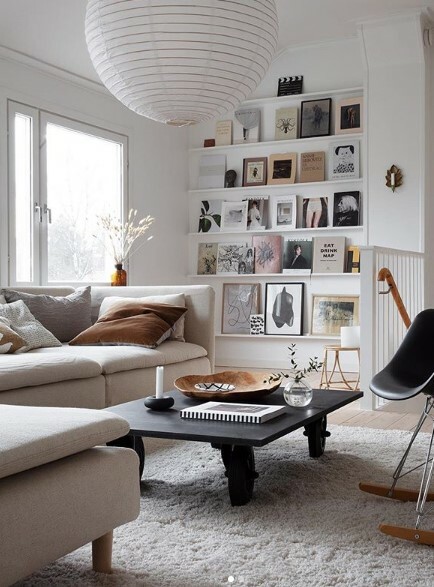 Sticking to her Scandi roots, she’s a big fan of Nordic design, keeping her colour palette neutral, and throwing in modern accessories such as cool poster art or minimal table lamps next to more classic wooden furniture. Another Scandi doing things right when it comes to beautiful styled homes! There is no shortage on content for Janniche’s Instgram, as every nook and cranny in her home is truly photographenic. Over at @bloggaibagis, you can scroll endlessly through perfectly styled kitchens, candle-lit dining rooms, cosy living rooms filled with warmth from the fireplace, but more so than all of that, you’ll fall in love with how muted painted walls can really transform a room. If you don’t know Anne from City Sage - you do now! An LA-based designer and stylist, she recently renovated her home, room by room, and shared all it all on her Instagram! We, of course, were following along, and we’re loving the results. Known for always choosing a neutral colour palette, we love how she uses black, gold and brass accents to make the room pop. Anne is proof that you can’t forget about accessories when it comes to home decor - art, mirrors, and trinkets are treated with equal importance! There is no such thing as too much colour and texture in Justina Blackeney’s world! The owner of the Jungalow, this is true Bohemian heaven! Mixing things up and creating new rules when it comes to interior design and styling, check out how Justina has super cool wallpaper in each room and isn’t afraid to include in rugs, throws and pillows in abundance. There is so much character and personality in this home. Caroline Lee, one half of Team Woodnote, is best friends with the colour pink (and with Anne Sage from City Sage!). A photographer, stylist, podcast-er, producer, lover of interior design, advocate for all things good and just in the world, Caroline just seems like a cool chick. On top of that, she’s recently bought an amazing A-frame house in Palm Springs, and is giving it her signature whimsical art-deco make-over. Jealous! We hope you found this article inspiring and useful and do tag us on Instagram or Facebook with #makeroomsingapore if you managed to give some of our tips and ideas a try! We look forward to seeing some creative ways you design your space and it may even be featured by us! Stay tuned for more tips and tricks.